Availability: This project is sold out, please inquire directly for models that may be available from the secondary market. 2/20/08 - The PT-4 tender mentioned below was sold. 2/18/08 - We have recently reacquired one of the limited edition PT-4 tenders that were built at the same time as our 'Late' Hudson. It is available for purchase at the original price of $950, please contact us directly if you are interested in purchasing this model. 4/1/01 - Perhaps our final update on this project, we are finishing up our deliveries and as of Monday the 2nd we will have only those models not fully paid for on hand. Second notice letters are in the mail to those with balances still owing, after the elapse of an appropriate period, any model not paid in full will be offered to those on our extensive wait list for this project. The feedback from owners of this project has been extremely positive and for that we are very pleased. We will continue to maintain our service log for this project in an effort to keep all that are interested informed about what our experiences are with the Late Hudson and we will use this most valuable of all information in planning and developing our future projects. Many people interested in this project have not been aware of the fact that we built a very limited number of extra PT-4 tenders for sale separately, this is the first general announcement of that fact. The PT-4 is probably the most significant tender in railroad history, it's capability of 'scooping' water at 80MPH makes it unique and our replica stands on it's own as a great model. If you are interested in a separate PT-4, get in touch with us directly. 2/18/01 - After the interruption of doing a couple of shows, we are back hard at work getting our production models delivered. The reception that our sample received at the latest shows was fantastic, I only wish we had more to sell! 1/25/01 - The delivery has started!! The models are finally headed out the doors after another visual and operational inspection on an individual basis. We have often been asked why it takes us longer than most to ship models and the answer is very simple; we work very hard right up to the end to make certain that we are delivering a quality product and that it actually operates out of the box! In hearing the stories of the recent deliveries by other importers and the problems encountered by their customers, it has helped to drive home the point to us that we are taking the correct approach even though it takes extra time and effort on our part. We feel that our clients agree and we'll continue our course. We will be posting one more series of photos from the production models so everyone can see what we have ultimately delivered. Check back soon to see our latest delivery. 1/15/01 - The models are finally in the country and working their way through the import process, everything is going fine so far, although slower than we would like. We expect to take delivery in the next couple of days and as soon as we have them, we'll start the delivery process. We are particularly anxious to hear the feedback from customers on this project as there are several surprises in terms of model features. We'll see who finds them all first! Stay tuned, as soon as the first model goes out our door we'll post the word so that everyone interested in the delivery will know what's happening. Many thanks to our customers for your patience, I believe that you'll feel that it was worth the wait. 12/21/00 - Just a brief update for those of you that have a 'Late' Hudson on order with us. The models have been finished, they look fabulous thanks to the efforts of our builder S. J. Models and they are being moved into the States as you read this. Freight traffic during the holiday season is always a challenge, with holiday schedules and the vastly increased volumes, it's not how much you are willing to pay, it's who you know if you want to try and move something by air, particularly when your a little guy like us. An added concern is that the carrier is someone credible and that will handle what has taken us a year to builder with care, to hand our customers an insurance check at the end of a long wait serves very little purpose in our long range planning. We expect to start the delivery process right after the first of the year to all of those that have paid in full. If you are a customer for this project that has paid in full you should have already received, or will shortly, a confirmation of your payment including an additional explanation regarding the delivery of your model. Your continued support is one of our most valued assets! 11/13/00 - Shown below is our first painted sample for this project. Having just returned from another inspection trip, I can tell you that the progress towards completion is progressing smoothly and those that have a 'Late' Hudson reserved will have a nice early Christmas present. We will be posting a complete set of images from this sample just as soon as time allows. 10/04/00 - I can happily say that we are nearing the completion of our 'Late' Hudson project and I can say this with a feeling of excitement and not relief! We've been working on NYC Hudson's for quite a while now and the tendency would be to become board with the subject, but in our case that couldn't be further from the truth. We are thrilled with what we have been able to accomplish with our development and are also extremely proud of our results. It has been a painstaking effort to get everything as close to perfection as we possibly could, from our recreation of the NYC lettering style to the inclusion of the miniaturized data plaques, we have tried to push our final results to the next level to enable us to deliver a scale model that stands apart from all others. Although this project has been sold out for months, we will be displaying our production sample at the upcoming shows later this month, I hope that you will have a chance to see it. New photos will be posted as soon as time allows. One of the most interesting aspects of this project is the purpose-built Lima PT-4 centipede tender. Because the PT-4 turned out to be such an interesting model in it's own right, we decided to offer a very few separately for sale. 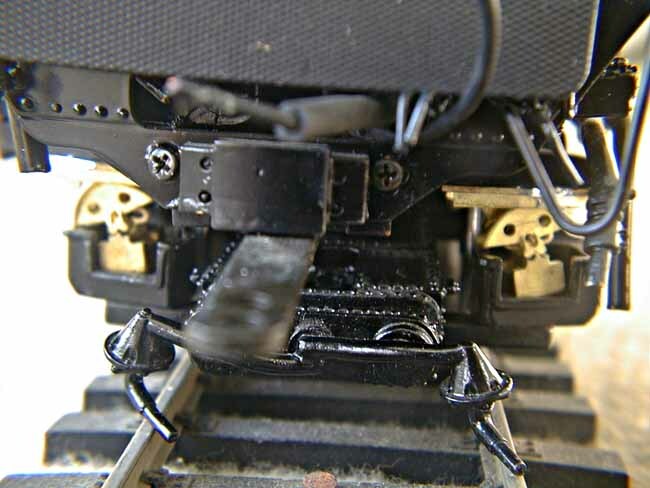 With it's pedestal suspension and ten (10) real leaf spring sets the PT-4 winds up being more detailed than most locomotive models. Details of this offering will be released shortly, but if you are interested in a separate PT-4 let us know and we'll keep you posted. Lastly, final notices will be going out in the next few days to those holding reservations for 'Late' Hudson's, we expect the models to be countryside this month and in order to be prepared to start shipping at the earliest opportunity we need to get the financial side of the project in order. As with previous projects, those that pay first will receive their models first, that is the only fair way to handle the delivery. 8/30/00 - Consistent with our philosophy of trying to deliver more than we promise, in the photos below you'll see the latest detail added to our 'Late' variation J3a Hudson. functional hard rockers on the trailing truck. They roll from side to side as do the prototypes with the swing of the trailing truck and they are also sprung for vertical travel. Once again my hat is off to our builder Sun Jin Models, their dedication to building fine models is what makes all of this extra effort possible, when other builders would tell us no way, Mr. Lee and Mr. Han consider the challenge and push forward in an effort to be better than the competition and more importantly, to deliver the best model they possibly can. When some would ask why we typically run late on the delivery of projects, this one example why..............as I have explained our approach, better late and better than just on time. 8/25/00 - The final invoices for this project will go out at the end of September, we are trying to separate the financial burden of this project from that of the Y6b reservations as much as possible, but it will not be an ideal situation. The extra time taken to finish this project will pay dividends in detail and quality, as always, we are not trying to be fast, but as thorough as possible on each and every project. We will be posting production sample photos very shortly.................it's all a matter of hours in the day............and night!! 7/27/00 - After another inspection trip to Korea and a review of this project in person, I am more excited than ever about the progress and development. Considering that the project is sold out and has been for several months, it would be easy to sit back and just build the project out based on the original specifications offered when reservations were taken, but we're still pushing to increase the features that we ultimately offer. This represents a commitment on my part, but more importantly it is a continuing indication that our builder, S J Models is fully dedicated to developing and building the finest products possible. The completion of the project is drawing near, but as usual we're behind schedule and when you care about what you deliver, that's what happens. Completion is about four (4) weeks away and we will keep you apprised of the latest developments. The latest sample model will be on display at the NMRA National Train Show in San Jose, California starting on the 4th of August. We hope to see many of you there. 7/10/00 - We have posted a series of twenty-four (24) photos of the latest sample model on the 2nd Sample Model Construction Photos page. This project is pushing towards completion late this month and it promises to be another stand out model. Of particular note on the sample is the de-streamlined smoke box face, a feature unique to only four (4) of the original prototypes late in their careers. The smoke box face was not a specially build unit for these locomotives, but rather the standard one used under the streamlined 'bullet' nose of the Dreyfuss Hudsons, when the nose of a Dreyfuss was swung open, the 'de-streamlined' front end is what you would see. 6/19/00 - We expect to have the latest production sample of this project in hand in time for the O Scale Nationals in New Orleans at the end of the month. The timing for delivery has been allowed to 'slide' to accommodate several issues, most importantly to insure the quality of the finished project. Although everyone is anxious to receive their 'Late' version Hudson, many are not financially anxious as they are still recovering from the GG-1 deliveries, we are trying to take all circumstances into consideration as we move forward. It seems that a comfortable delivery schedule would be mid to late July so that is what we are now planning. As soon as we have the latest sample in hand we will be posting new images to the site for all to see. 4/16/00 - Just a quick update, the models in this project are in the process of being painted as confirmed by the builder. We are still on schedule for completion of the project late next month. Stay tuned for more information and photos. 11/10/99 - This project is already a sell out with many reservation requests still coming in from overseas. Just when we thought we had everything possible in terms of research material and background information on this project we have come up with more thanks to a couple of our customers. 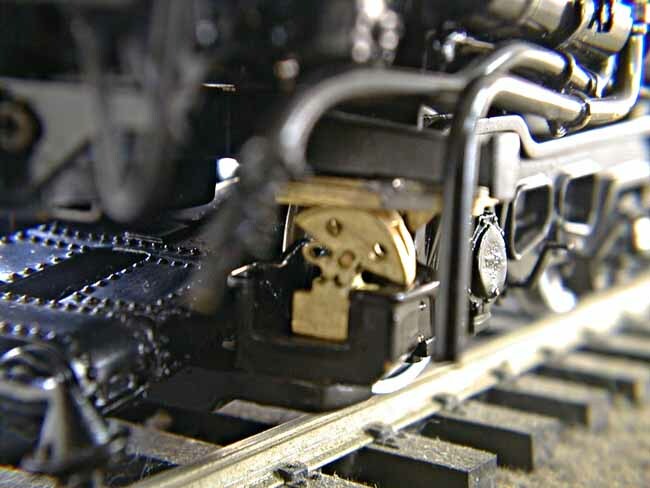 In the last couple of weeks we have come up with new documents that provide incredible insight into the life and history of the J3a class of locomotive, this information will allow us to include the most subtle of details that will make this project truly special. The historical nature of our projects is for us a truly thrilling part of what we do. 10/20/99 - A mistake was brought to our attention in the confirmation letter that went to customers holding reservations for this project. The delivery timing refers to an 'early August' delivery, it should have read late January of 2000. A correction is being mailed to all those affected customers. 10/17/99 - The final evaluation of the sample model has now been completed with the assistance of the best authorities on the subject. We are fully confident that our final design is as accurate as possible in every detail and feature. The construction of the boiler assemblies has already begun and the frame components are also on the work benches. we have made a number of improvements in progressing from our first project, these changes will be detailed in an update mailed to all individuals holding reservations. 9/25/99 - The sample models are currently being reviewed by the appropriate experts and in this particular case, I do mean experts. While with some models there are individuals that have extensive knowledge to draw on for review purposes, I would hate to classify them as experts, such is not the case with this project. We have truly the best available guiding our efforts with the 'late' Hudson. There seems to be some misunderstanding regarding the reservation process with this model. Some weeks back we did an informal survey of interest with our existing customers regarding this project, this was not an official reservation, if your are an existing customer that is interested in purchasing this project you do not have a reservation unless you have responded to the official offering and forwarded a deposit. There have been a number of customers that assumed because they responded to the survey that they had a binding reservation, this is not the case. The remaining hand-full of models are now being offered to our new GG-1 customers. The offering mailing is just being sent out. 9/2/99 - The official offering for this project is in the mail to existing Hudson customers per our original commitment. The demand for this project is overwhelming and I wish that we had another 100 units to offer, but there are only 50 units in total. We are trying hard to space the delivery of this project out from the GG-1 so that the financial burden will be manageable, we are looking at the end of this year for delivery. 8/13//99 - Due to a delay in photo reproduction for the official offering, it has been delayed until the 16th of this month for existing customers and four weeks later for all others that have expressed interest in this project. 7/30/99 - The official offering material for the 'Late' version of the Hudson with PT-4 tender will be mailed to existing customers on the 9th of August and four weeks later to all people that have expressed interest in the project. 7/10/99 - We are expecting to have the sample model for this project on display at our next two shows. Immediately after the first show we will be doing the photography and preparing the offerings materials to be first sent to our existing customers later this month. There will also be photos posted to the appropriate web page just as soon as they are available.